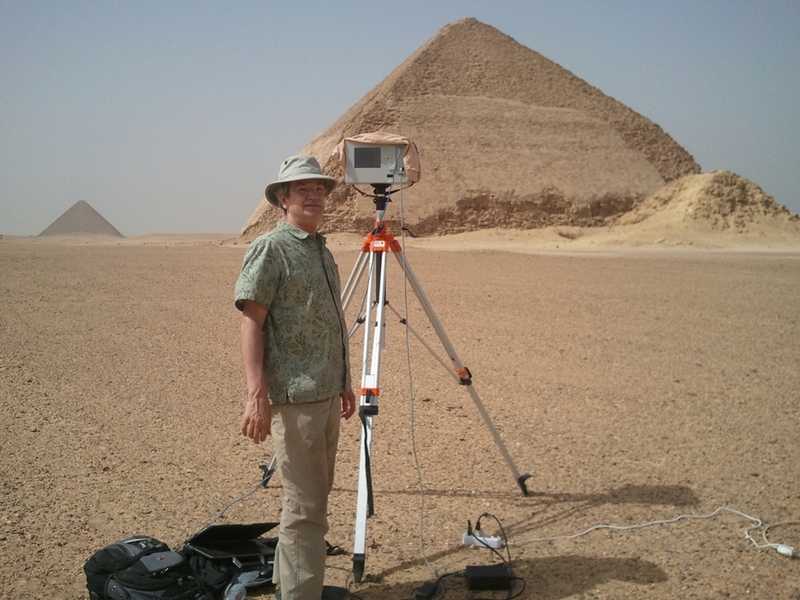 CAST Researcher Malcolm Williamson conducting field work in Egypt with an Optech ILRIS-3D scanner. An article on planning for international travel with "high-tech" field equipment published by U of A researchers Fred Limp and Malcolm Williamson has been selected as the February 2018 Journal Article of the Month by Cambridge University Press. The selected article, "Strategies for International Travel with 'High-Tech' Archaeological Field Equipment," was originally published in the journal Advances in Archaeological Practice in August 2017 and will be free of charge on the Cambridge University Press website through the end of March 2018 on the Cambridge Core blog. Cambridge Core provides access to unique, scholarly content published by Cambridge University Press, in one user-friendly and fully searchable online platform. A wide range of high-quality academic content is available across Cambridge Core, including leading journals, research monographs, reference works and textbooks. The article discusses the complex legal and operational questions that field researchers need to consider when travelling internationally with "high-tech" research instruments, as well as the many U.S. regulations that control the use of high technology instruments around the world. These include such technologies as portable X-ray diffraction; ground penetrating radar; high-precision global navigation satellite system receivers; laser scanners; multispectral, thermal, lidar, and hyperspectral instruments on uncrewed aerial vehicles; and many others. Researchers must be aware of restrictions that limit travel with selected specialized devices, as failure to plan for these can lead to substantial costs, denial of entry and, possibly, criminal indictments. The article also reviews the various duties and taxes that can be assessed on instruments when they are brought into foreign countries, and provides strategies to reduce or eliminate such charges. Practical advice on shipping and baggage alternatives are also covered. The article draws upon the extensive experience that researchers from the U of A Center for Advanced Spatial Technologies have developed during their engagement in global field research. Over the last decade, CAST has conducted field research in more than 30 countries across 6 continents, including China, India, Syria, the United Arab Emirates, Georgia, Bolivia, Peru, Haiti, Sudan and Ethiopia. Limp and Williamson were greatly assisted in the development of their article by the help of Candita Meek the U of A's Export Compliance Coordinator in the office of the Vice Provost for Research. About the Center for Advanced Spatial Technologies: The Center for Advanced Spatial Technologies is a multi-disciplinary center for spatial research and technology housed within the J. William Fulbright College of Arts and Sciences at the University of Arkansas. Established in 1991, CAST offers students, faculty, and the public opportunities to learn about the various applications of geographic information systems. CAST investigators span the social and physical sciences with expertise in the measurement and analysis of spatially referenced, multi-scalar data and processes, and are funded primarily through external sponsorships. More information about CAST can be found at cast.uark.edu. For ongoing news, follow CAST on Facebook and Twitter.